Seven more Filipino netters earned spots in the main draw of the PCA Open-Cebuana Lhuillier Asian Tennis Federation (ATF) Tour beginning on Thursday at the PCA indoor shell-clay court in Paco, Manila. Heading the list are Filipino-Italian Marc Reyes and Davis Cup veteran Elbert Anasta, who both reached the semifinals of the recently concluded PCA Open men’s singles. 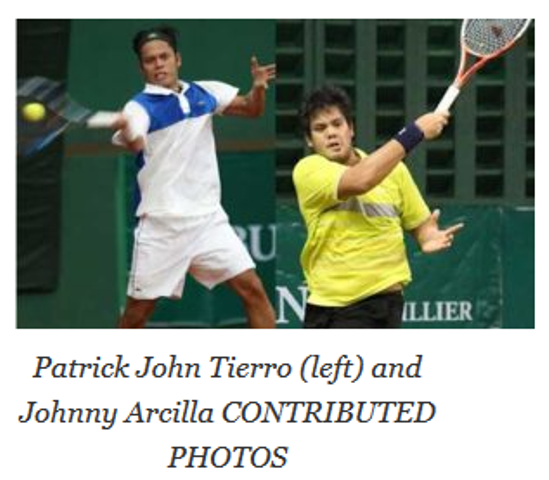 Joining them in the 32-man main draw are Kyle Parpan, Argil Lance Canizares, Rolando Ruel, Ronand Joven and Eric Olivarez Jr.
Two-time champion Patrick John Tierro and eight-time titlist Johnny Arcilla got the first two slots for reaching the finals of the PCA Open. “I have always been excited every year for PCA Open as it is the biggest tournament. Moreso, the past two years as it has become an international tournament. This will give our local players the chance to pit skills with the best from Asia and gain world ranking points,” said Cebuana Lhuillier President/CEO and Philippine Lawn Tennis Association Chairman of the Board Jean Henri Lhuillier. Among the notable players to see action in the four-day meet are Indians Kunal Anand, Karunuday Singh, Anshuman Gulia, Ayush Mintri, Manin­der Singh, Parth Aggarwal and Medhir Goyal, and Iranians Moham­madali Mamaghaninia and Amirali Sedghinasab. “Sometimes, all these [Filipino] players need is an opportunity to showcase their talent. I really hope they will do well,” added Lhuillier. A total prize fund of $7,500 with the champion getting $1,200 and the runner-up securing $900 in the ATF event supported by Dunlop, Whirlpool-Fujidenzo, Chris Sports, Mary Grace, Aseana City, PVL Restaurant, Maverick, Compass, Babolat, Just Jewels, Rexona, Palm Rock, Coca Cola Femsa Philippines, Pearl Garden Hotel, Pearl Lane Hotel, Sen. Manny Pacquiao, L&M, Broadway Motors, Stronghold Insurance and Monte.